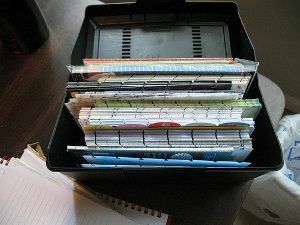 Home » Personal Finance » How Long Should You Keep Your Financial Records? With tax season in high gear many of us are going through various financial documents. Part of the process, of course, is trying to figure out what to keep — and what belongs in the shredder — when it’s all over. There are companies like ShoeBoxed that can help you keep things organized, but you usually have to pay a fee for the service. Which Tax and Financial Documents Should I Keep? Before you go through the effort and cost to preserve a document digitally it can help to know whether you are going to need it. Here are some guidelines for keeping (or throwing out) financial documents. Any time you take a tax credit or deduction it is a good idea to have some sort of documentation to back it up. You can keep digital copies of this information if you want, but you should also have originals somewhere. Keep copies of these documents with the copy of your tax return that you hold on to. Credit card and bank account statements: Shred after reconciling, unless you will need it for a warranty claim. Investment statements: Shred quarterly statements when they are replaced by new statements. However, annual statements should be kept until you sell the investment. Receipts: Unless you need it for a warranty, or if you think you’ll take something back to the store, these can be shredded as soon as you record them in your personal finance software. Most insurance policies: Most insurance policies that are renewed each year (or semi-annually) can be shredded when replaced with the renewed policy. Pay stubs: Only keep these until they are reconciled with your W-2 or 1099. Loan documents. When the loan is paid off you can shred the documents — but only after you receive the official title or deed. Vehicle or boat records. Having maintenance documentation can help you sell the vehicle in the future and back up any warranty claims. After selling a vehicle or boat you can get rid of maintenance records and other documents if the new owner does not want them. Investment transaction confirmations. You will need confirmation of investment purchases in order to establish a cost basis for tax purposes. Once you sell the investment your document is moved to join the tax return for the year in which it was sold. If you want to convert paper U.S. savings bonds to an electronic form you can with Treasury Direct. In some cases you will essentially keep your documents forever. Life insurance. Life insurance policy documents should be kept until the terms are fulfilled. This means that you should keep these until you die (or until the term ends if you have term life insurance). Defined benefit plan documents. These should be kept forever — even those from former employers. Estate planning documents. Of course any estate planing documents you have should never be thrown away. Any documents kept for the long-term should be kept somewhere secure, such as a fire safe, where they cannot be ruined by flood or fire. @Josh — Good tip on Form 5498. Thanks. This is great information, I’m no longer confused about how long to keep many of my documents. I’ve had some experiences with receipts that makes me think that they should be kept for a short time. Maybe for the length of the billing cycle (credit cards) or until they clear the bank account (debit cards). It’s amazing the errors on charges that consistently go in favor of the vendor. If they’re minor it’s not worth pursuing. But I had one a couple of months back at a bagel shop where a $6.49 charge was entered as $64.90. Fortunately, I had the receipt and was able to challenge the charge successfully with the vendor. Now I keep all receipts until verified with the bank. Form 5498 which shows a record of your contributions to your IRA should be kept for the life of the IRA. This is especially important for a roth IRA where you may withdraw contributions early, tax free with no penalty.